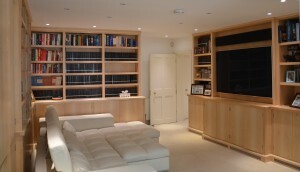 In solid and veneered maple, this lower ground floor library and media room features the latest technology whilst retaining a classic contemporary feel. An elegant library in polished maple for an elegant house. Featuring classic columns with hand turned capitals and bases, and a purpose made maple and stainless steel ladder, drinks cabinet and LED TV.